CHAOS & PAIN Bacchus is a dietary supplement containing vitamin B6, vitamin C, Kanna extract, β – phenylethylamine, Rhodiola Rosea extract, caffeine anhydrous, hordenine HCl, and 5-hydroxytryptophan. The preparation is a completely innovative mix of ingredients that, when combined, improve mood and intellectual functions as well as reduce anxiety and mental tension. Today’s world is characterized by a fast pace of everyday life, and the plethora of duties, work, study, lack of time for rest and pleasures can quickly lower mood and decrease intellectual abilities. Often, the stimulants come to the rescue to help temporarily, nevertheless, everyone should slow down and rest sometime. Here comes a modern preparation that improves mood, mental functions and reduces mental tension accumulated. Bacchus is characterized by a quick effect, which gradually and slowly subsides, counteracting the mood swings. The basic ingredient of the preparation is the Kanna extract (Sceletium tortuosum), which is characterized by a high content of alkaloids, mainly mesembrine. These substances are responsible for the psychoactive action of the plant, which has been traditionally used to improve mood and mental functions, as well as to support the treatment of anxiety or depression. The improvement of well-being is facilitated by the bioactive properties of mesembrine, which causes the inhibition of serotonin reuptake, thus increasing its concentration in the synaptic cleft, which in turn causes the increase of neurotransmission from one nerve cell to another. 5-Hydroxytryptophan (5-HTP) is a tryptophan derivative that is naturally produced in small amounts in the human body. The 5-HTP produced in the liver is carried with the blood to the brain, where it is converted to serotonin, which is considered both a neurotransmitter and a hormone. Serotonin is often called the happiness hormone because its proper levels are significantly associated with well-being. On the other hand, low levels of serotonin may lead to decreased mood, aggressiveness, fatigue or insomnia. 5-HTP supplementation increases the level of serotonin in the brain, and thus may participate in improving mood, relieving stress, and proper regulation of sleep and appetite. The preparation contains vitamin B6 in the form of pyridoxine hydrochloride. This beneficial additive accelerates the conversion of 5-HTP to serotonin, thanks to which the preparation works faster and stronger, providing a greater release of serotonin, and thus a more significant improvement in mood. Beta-phenylethylamine (PEA) occurs in the human brain, where it is believed to play the role of a neurotransmitter associated with mood modulation, increased mental energy level, and improved mental focus. The results of research on people practicing physical activity suggest that its secretion during exercise may be also responsible for the improvement of mood, thus increasing endurance and body's resistance to pain. Rhodiola Rosea is a very well-known herb with strong adaptogenic properties. The cross-section of the available data points to its positive effects within the nervous system, resulting in the improvement of the capacity to perform physical and mental work and the body’s ability to adapt to stressors. The most frequently described benefits that result from the positive effects of Rhodiola Rose include improvement in general well-being and physical fitness, reduction of mental fatigue, or improvement of permeability of the blood-brain barrier for serotonin precursors. Caffeine is the most thoroughly studied and described stimulant, which has been included in the preparation due to the stimulating properties on the central nervous system. Consumption of caffeine results in mobilization and reduction of fatigue. Caffeine anhydrous is a supplementation form of this substance, characterized by a better bioavailability, and thus a much stronger effect. Hordenine HCl is an alkaloid that has the potential to inhibit monoamine oxidase (MAO) – an enzyme responsible for the breakdown of neurotransmitters, including dopamine and serotonin in nervous tissues. By reducing the breakdown of these molecules within the nervous system, it increases the potential of their action on the body. Hordenine improves cognitive functions, increases motivation to act, increases energy levels, and contributes to a better mood. Numerous analyzes of the impact of changes in vitamin levels on mood and cognitive functions provide evidence that the proper supply of vitamin C is associated with better well-being, improved assessment of intellectual functioning and reduction of daily memory and concentration disorders. 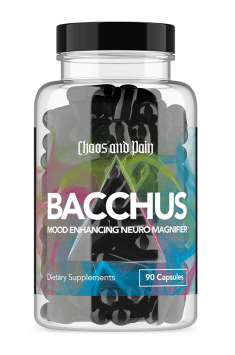 In summary, CHAOS & PAIN Bacchus is a dietary supplement, which is recommended to all adult learners performing mental work or exposed to stress and increased mental strain. The product will be useful during exam sessions or periods in which we spend more time on responsibilities related to the profession or interests, including mainly those characterized by a mental load and a greater involvement of thought processes. Take 1 dose of the supplement temporarily before mental activity or during periods of increased mental tension. Since the supplement may limit appetite, properly select the time of the meal. It is best to take the product on an empty stomach, 2 hours before or after meal. The dose of the preparation is best selected individually. It is suggested to start with a higher one and then gradually reduce it to a level where the effects will still be noticeable. Chaos and pain began as a small blog squeezed into the dusty, forgotten corner of the Internet. Jamie Lewis, and his training partner Wayne Banks, once decided that the blog's style (a large amount of high frequencies and aggressive approach) could well interact with supplements. Over the years. Jamie was producing his own fat burners, as market was lacking extreme legal alternatives. Thus, the two business partners have transferred a Jamie's vision into the supplement market. Gelatin (capsule), magnesium stearate, silicon dioxide. Supplement containing vitamin C, citrus bioflavonoids and zinc. It supports the immune system. 5-HTP (5-hydroxytryptophan) is a metabolite of essential amino acid, tryptophan, involved in the synthesis of serotonin which is a neurotransmitter and a hormone responsible for the quality of sleep (melatonin). Used in medicine as an adjuvant, to a small extent supporting the treatment of depression and insomnia. Due to the presence of melatonin at the same time it is improving the quality of sleep and improving the regeneration process. 5-HTP is a component of supplements supporting the production of growth hormone and it is a part of some fat reducers (reducing appetite). Dosage: Doses commonly used in supplements, depending on the purpose: 100-500 mg daily in divided doses, including approx. 50-150 mg before bedtime.